A Parent's Life to Behold, Through the Eyes of Insanity-n-Bliss...: Here's a Nifty Book Review and Giveaway! So many of you might realize from reading my posts that I am a bit of a worry-wort, and I am pretty sure that germs, rabid bats, and the like are out to get me and/or my family. You may also know that I carry around copious amounts of hand sanitizer, using 3 ounces on just one outing, and I will spray you with Lysol if you sneeze in my direction, because I am pretty sure you have H1N1. Well, this awesomely paranoid behavior didn't develop overnight, it all started when I had kids. -wondering if I should change his poopy diaper before running him to the ER because he went head-first into the rounded corner of our wall and was bleeding from his nose and lip. -that whole ordeal with Jacob's lump, which you can read about here. Basically, I am no different than many moms who torture the nurses and freak out about anything that happens between the hours of 11 pm and 6 am. If only, if only, I had had this book. "Are you the kind of parent who panics every time your kid hits his head or wipes away a drop of snot? Or are you the parent handing a hemophiliac four-year-old a box cutter? Maybe you don't actually have any kids and just like dropping fascinating tidbits of information at dinner parties. Whatever the case, this book has got something for you. What would happen if your child ate the decorative pebbles in the fish tank? Actually, probably nothing. But a teaspoon of what liquid lurking in your medicine cabinet could kill a room full of toddlers? How do you know if a kid is dehydrated or not? Sick with pneumonia or just a cold? Has appendicitis or just a belly ache? This book is not about the basics of child care such as bathing, diapering, and feeding. There are many wonderful books out there that already cover these topics. Instead, this book is a regurgitation, if you will, of all the midnight conversations I've had with stressed out and anxious parents. As a pediatrician with specialized training in pediatric emergency medicine, I have experience in treating ill and injured kids. It's what I love to do. However, somewhere along the way I started thinking, 'Hey there should be a book about this.' "
Yes, and had I had this book, I would have had two less ER visits, one less hospital admittance, avoided a disastrous CT scan, less nurses yelling at me, and a lot more sleep! 1. Leave me a comment, with a safe way to contact you, about why you want this book. 2. Tweet this giveaway, and come back here leaving a separate comment with the link for your tweet. 3. Blog about this giveaway, come back here and leave me a link to the post. I will choose the winner using the Random Number Generator on July 30th, 2009, at 12 pm. I hope you win! And by you I mean you, of course. i want this book. because i just do. idk. i just want it. i waaaaant. it. i vart it. i really do. man i want this book. Ohhhh....and because you're such a giver, you're getting a free subscription to More Magazine! Yup, you and Wendi both - because I don't want to have to separate you when you fight over it and then I'll be calling the triage nurse! So yup. Head over to Lulu's to get your info so we can get the lovely mag peeps to send you sumpin'. oh what a wonderful idea. can i win this so i can answer all those questions when moms ask me? I would like this book because when my daughter was 18 months old she was stung by a bee. I then spent the ENTIRE night hovering over her with a flashlight searching for signs of anaphylactic shock. I am currently 34 weeks pregnant with my second child, God help me. I've been known to call poison control when I found black specks of something mysterious in my daughter's mouth. Also, I made the lady at the front desk laugh convulsively as I asked just how on earth I was supposed to get that popcorn kernel out of Emma's nose. I would love this book for information and so I won't be a worry-wart!! 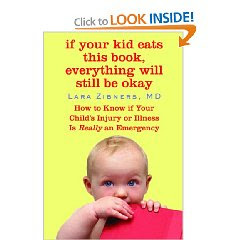 I just bought this book because I am a Class 1 paranoid, OC, germ-a-phobe and I need guidance so that I don't turn my baby into an ER regular. I am loving the advice. I want to win a copy for a friend who just had a baby and is a lot like me. She's already made two trips to the ER! I should have had this book when I called Poison Control to see if it was ok that my kid ate Play-Doh. Yes please...I love this blog and that is why I'm entering this giveaway...looks cool! I can totally relate to this! I became friends/enemies with the on-call nurses when I'd call about every little thing Taylor did, or didn't do. His poop was too big, it was too small, it wasn't happening, he didn't look happy to see me, etc!! I am crossing my fingers, as I am pregnant with my second!! Pick me! Pick me! Haha! Judahmom7@msn.com :-) Seriously, Pick me!